The Dodge immediately cut a niche for itself upon its introduction in 2008 and has all the while maintained a sharp focus on its target users especially in features of flexibility, packaging and its body. The models have always been designed to suit those astute families who want an ‘all in one’ car but it has lacked a cabin and a powerful drive train. 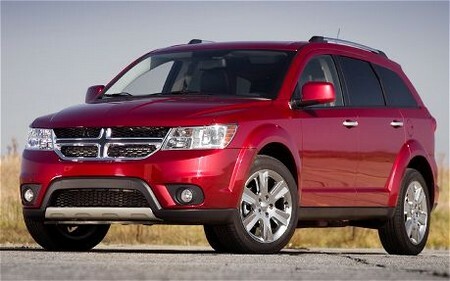 The 2011 Dodge journey presents a real wagon with a capacity of seven suitable for a typical family tour. The 2011 Dodge fixes most of the previous short falls but looks almost unchanged in its externalities. The old comical and unattractive dash has been replaced with a new dash design which is more polished though it compromises on the knee space in the front seat. The four cylinder, 4-speed drivetrain which has held the journey below $20,000 even with the trade-offs for shift quality doesn’t match the new journey’s Pentastar V-6 which replaces the ancient 3.5 liter, V-6, 235-hp that felt outdated in all aspects. The new V-6 covers up as a more polished and lush option which is plainly better though it doesn’t exactly show the 283-horsepower stated power. Leave out the new 6-speed automatic which is shaky and timid. The Journey displays better responsiveness with alteration in the suspension, more responsive shocks and lowered ride height clearing the dullness in response. The Journey retains a high ride quality with good roll control and damping suitable fro a family car. The steering is still a disappointment. In its interiors, the Journey remains largely unchanged apart from a few new features here and there. It has an ample space for 4-adults or 2-adults plus 3 kids or 4 kids with acceptable head and leg room. The mid-grade and up-grade Jouneys, the second-row seats can be slid fore and aft to create more leg room while the front seats have an in-built storage underneath the seats. The center console can also assume a new slide top and position. The cargo space behind row 2 measures is 37 cubic feet, there’s more space behind the raised rear most row measuring 10.7 cubic feet. The Journey has a long list of entertainment option features which will push its base price beyond $20,000 if fitted. These include: a DVD system, a premium audio system, uConnect multimedia MP3 controls, a Garmin navigator, travel link, Sirius satellite radio, a back TV and an on-the-go service allowing a limited selection of kid programs. Standard features for Journey include: cruise control, powerlocks and windows, air conditioning, an AM/FM/CD/MP3 player, a cooled glove box, USB port buried in the center console and a telescoping steering wheel. Bluetooth comes free with the 3-top models but it’s also available with the Mainstreet and base models.